Last week, I wrote a post about the chickens that have a new home in the Expat compound. I think these chickies will be end up being in a series of posts...'cause they don't seem to be going anywhere and provide me (and a few others) with some serious entertainment. Every night, their Expat "dad" (giggle) goes out back and turns the patio table on it's side so that the chickens will have a place to roost. And then in the morning, he goes out back, turns the table back, hoses off the deck, and spreads some corn in the grass (he went into town and bought some). Another neighbour has kindly offered to bring home some wood, etc so that the chicken dad can build them a proper area to roost. As I'm going through my pictures from my drive to Tana and back (that I keep writing about but have yet to post any pictures)...I'm amazed by how gorgeous they turned out. I've seen a very, very small percentage of Madagascar, and I can't beleive how incredibly beautiful it is. There are some places that are completely breathtaking. And....for every breathtaking scenic moment, there is a scene of heartbreaking and ugly poverty. I think that sometimes...I'm de-sensitized to it all. Any/every time I go shopping, I'm met by children in tattered clothing begging for money or candy. I try not to think about it. The city I live....isn't really a city. I work in the tallest building - and it's two storeys tall... But Antananarivo (or Tana for short) is a serious city. I took a quick video this morning from my hotel room. Tana is very interesting... not as bad as I once thought. But I don't think I'd like to ever live here. (I love the background music in this little video though. :D)Wedding and drive pictures to follow soon....I`m back on the road again for home! What's a wedding withouth little girls in white dressing running around and playing? I just finished eating supper at the REALLY nice hotel. It's SUPER clean, has zero ants, and amazing service. I am too busy to check out the spa tomorrow morning...but will SOMEHOW manage to fit it in this weekend. I'm leaving Friday morning to go from Toamasina to Antananarivo (Tana for short). I've never gone by car - and from the sounds of it, I'm up for a bit of an adventure (and what isn't in MG?). Upon my arrival, I'm staying at the Hotel Palissandre and Spa. 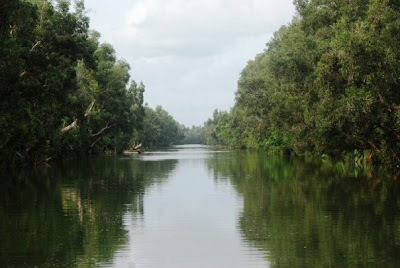 The Canal des Pangalanes is a series of man made and natural lakes linked by rivers running down the east coast of MG for about 300 miles and is mainly used for transportation and fishing. 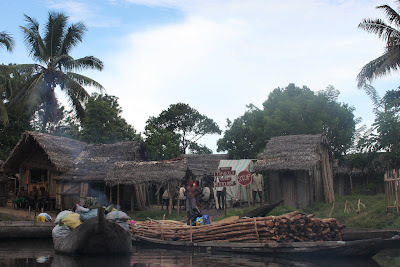 We spent about seven hours there and back (including stops along two fishing villages and a small hotel for lunch), so I'm sure we only saw a very, very small part of the entire canal. It's always interesting, never the same twice, and just a great way to spend a Sunday. Even with what seems to be nothing - they take great care and pride of their homes. The first village we stopped in had a school. This school teaches ONE HUNDRED AND FOURTY elementary school kids. I couldn't resist taking a picture of these lucky boys that had toy trucks to play with. I made sure to put some candy for them inside the back of their truck.